Aims to promote the mental wellness of its members through yoga and guided meditation. As promoters of mental wellness, we will be hosting activities like group yoga classes, meditation classes and nature hikes. MU-NSTA is an organization that provides professional development opportunities for those students interested in becoming science teachers at all levels or those interested in being science educators. Members are dedicated education students and teachers who focus on current trends in science education and meet to discuss issues, share innovative lesson and teaching ideas, research findings as well as to engage in service projects devoted to science education issues. Monthly meetings are held to encourage dialogue with other members and to build collegiality. NCTE-SAM (The National Council of Teacher of English – Student Affiliate of Miami) was founded in 1995. Students studying to be an English/language arts teacher in any program in EHS are eligible for membership in NCTE-SAM. The group holds regular meetings to learn about teaching of English/language arts. The purpose of the council is to provide a forum for pre-service social studies educators to discuss and learn more about issues related to this subject. Guest speakers and designated topics of discussion pertaining to social studies comprise the meeting's agenda. MUFLA is an organization that seeks to promote foreign language education, to make networking opportunities available to students interested in the teaching of foreign languages, and to establish professional ties. MUFLA holds monthly meetings that provide: expertise relating to the teaching of foreign languages by guest speakers, opportunities to discuss issues and trends in foreign language education, and the sharing of opportunities available of further professional development of members. MSEA is a pre-professional organization of undergraduate and graduate students preparing for careers in education. As a member, students are also a part of the larger Ohio Educational Association. MSEA members are a part of the National Education Association. Monthly meeting are held to encourage dialogue with other professionals and to discuss current issues in education. Students from all licensure areas are welcome to membership. Kappa Delta Pi, the International Honor Society in Education, is dedicated to excellence in education. The university chapter is a dynamic community of developing educators pledged to worthy ideas to improve education and teaching. Students from all licensure areas are welcome to join. Membership is obtained and maintained through participation in events and activities furthering the vision of quality education for all. Assist in the fostering of service dogs, educate the public on service dogs and disabilities, and help service dog training organizations with their mission to improve the lives of people with disabilities. Best Buddies is a non-profit organization dedicated to establishing a global volunteer movement that creates opportunities for college students to have one-to-one friendships with people who have intellectual and developmental disabilities. 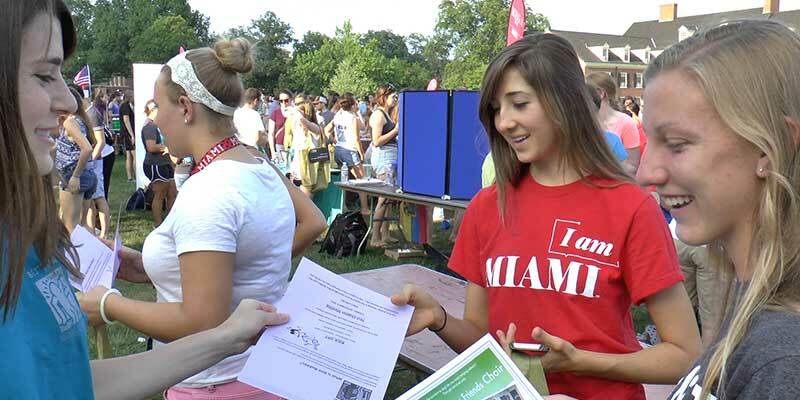 Goals of the club are to increase cultural awareness and diversity within the Miami University community. Members are provided with opportunities to further their educational knowledge and experiences through activities such as seminars, guest speakers, group discussions and attending conferences. The SCEC is part of the Council for Exceptional Children's student division. SCEC provides professional development and leadership opportunities for pre-service special educators and provides services to individuals with exceptional learning needs in the community. Monthly meetings provide opportunities for interaction with fellow students and leaders in special education from the faculty and surrounding communities. Service projects will help involve students with individuals and groups in the surrounding area. A part of the Miami University art scene since 1933, Dance Theatre, is an eclectic dance company producing work in many dance genres. In a major concert held each semester on campus, usually in Hall Auditorium, the company showcases boldly innovative and diverse choreography, utilizing the talents of guest artists, faculty, and student company members. Dance Theatre has had a strong outreach program in underserved elementary schools in Butler County in the past. For more information, please visit the Dance Theatre website. MUSATA is a student-run organization created to maintain an environment which will sustain professional development, fellowship, skill development, and promotion of the Athletic Training Profession. Educational in-services are usually held once to twice a month. To become a member, one must attend all monthly meetings and be current with their dues. Dues are used for speaker gifts, educational models and programs, partial cost of attending professional meetings, and other activities related to our athletic training program. The purpose of this organization is to foster the professional, educational goals and interests in the fields of nutrition, food service management, and dietetics. The organization will pursue these objectives in affiliation with the Ohio and Academy of Nutrition and Dietetics. This affiliation provides assistance in preparing programs and furthers our purpose. All students enrolled at Miami University, who have an interest in food and nutrition can join and become active members. Phi Epsilon Kappa is a national professional fraternity serving students in sport, recreation exercise science, kinesiology, health promotion, sport medicine, and athletic training. The Miami Alpha Iota chapter is housed in the KNH Department and open to any student of any major who is interested in sport, health, and/or exercise or fitness related careers or graduate programs. Some of the events and activities planned and sponsored by Phi E K are a guest speaker’s series with KNH alums and others working in KNH-related careers; a workshop on applying to Graduate School; a Health Fair; trips to academic and professional conferences/meetings; and a partnership with fund-raising events supporting youth sport programs at Oxford Parks and Recreation. If you would like more information regarding Phi Epsilon Kappa, please contact them via The Hub or contact Dr. Freysinger. This organization (PPOT) has been organized for and by students for over 15 years. It provides students of all majors with information about career opportunities and schools in Physical and Occupational Therapy. Monthly meetings include invited speakers from local OT and PT programs and field trips to visit OT and PT schools and clinics. The student-led organization that represents the students enrolled in the Sports Leadership and Management Major in the KNH Department. It focuses on activities and projects designed to enhance Sport Leadership skills for its members. This organization aims to develop and facilitate member interest in regards to Anatomy and Physiology through education, exploration, socialization, and philanthropic projects. Members will further develop their interest in anatomy through educational activities relating to such topics, exploration of career paths utilizing knowledge of such sciences, and socializing with other clubs with the goal of developing outside interests, networking, and co-hosting volunteering and fundraising events. Philanthropic projects will entail fundraising and volunteering with the goal of supporting charitable and worthwhile causes representing physical ailments and disorders. Membership is not exclusive to science majors, but rather anyone who is interested in these topics. FSWSO is open to all Miami students interested in increasing their knowledge of and experience with the fields of Family Science and Social Work. Being an active member includes regular attendance of monthly meetings and participation in campus and community events, programs, and activities. Phi Alpha National Honor Society for Social Work fosters high standards of education for social workers and invites into membership those who have excellence in scholarship and achievement in social work. The Miami Tau Phi Chapter is open to graduate and undergraduate students. Students are eligible for membership after achieving the national requirements which include: declared Social Work as a Major, achieved Sophomore status, Completed 9 semester hours of required social work courses, achieved an overall GPA of 3.0 on a 4.0 scale and achieved a 3.25 GPA in required social work courses. Project Kids Network is a not-for-profit, charitable organization that provides meaningful experiences with both global and local volunteer opportunities to help children and individuals in need around the world. The chapter seeks to offer volunteer opportunities in Oxford and abroad to many Miami University students and to actively engage other university organizations, individuals and businesses in this work.